Accommodation Containers and Sanitary Containers - Economic. Flexible. Durable. 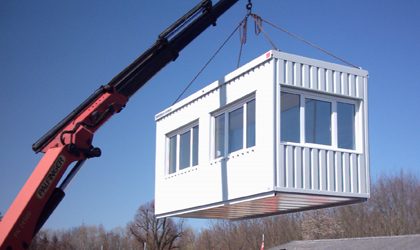 Accommodation containers are a quick and economic solution for the erection of offices, staff rooms, gatehouses and workshops. Sanitary containers are available as toilet containers and shower containers. We would be pleased to issue a detailed quotation for your individual accommodation or sanitary unit. Feel free to contact us.